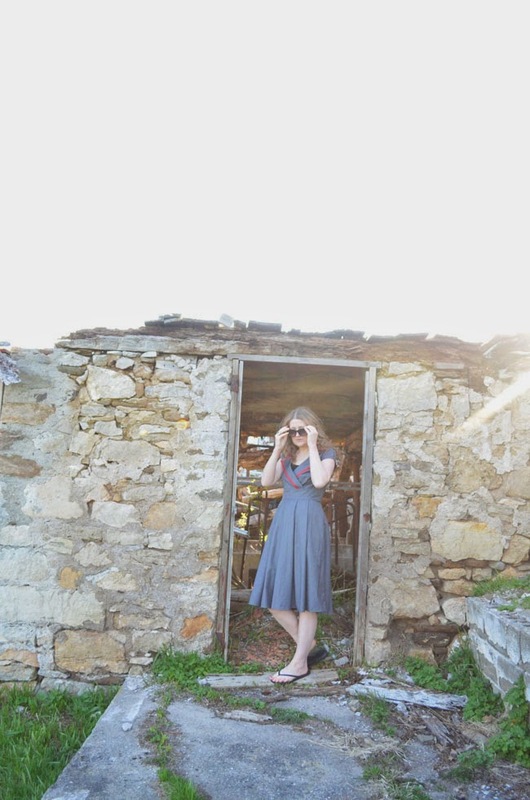 I have had this eShakti dress for several months now. I was just waitin' on a place to wear it! A place free from snow preferably. Now that I'm out of hibernation, the opportunity to wear this lovely dress presented itself this past weekend when we went to visit my husband's cousin and her family. 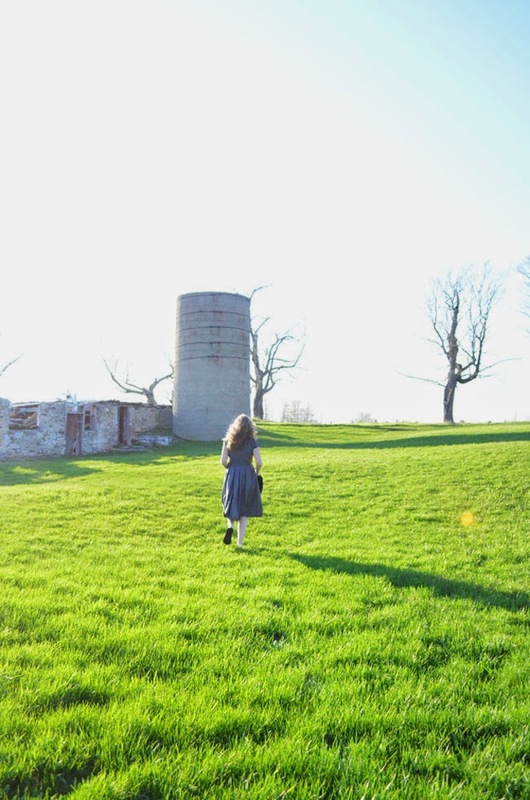 My little girl snapped some photos for me in their picturesque rural yard. What I like most about this dress is that it works pretty much anywhere - from a work meeting to a weekend jaunt in the city to a casual dinner with friends. Let me tell you, when you have a 9-year-old photographer who just wants to get on the trampoline, the photo shoot is over pretty quickly. 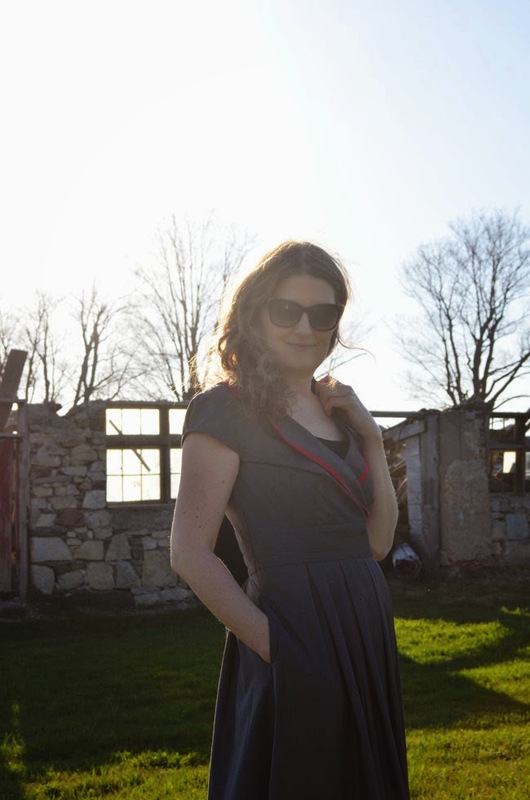 eShakti sells custom dresses at great prices. My dress is made from quality fabric, plus it's fully lined, with pockets. Pick a style, send off your measurements and pretty soon you'll have your own custom dress. Sign up for their newsletter because eShakti has great specials too (like buy two, get one free and stuff like that). A note for Canadians: I ordered two dresses on one occasion and was surprised by the amount of duty I had to pay at the door (about 50% of the overall cost). Even so, I took advantage of a sale, and I ended up paying just over $100 total for two lovely dresses (with duty). If you have a moment, visit eShakti now and tell me which dress is your favourite. They have great options for summer weddings too. Win a $50 gift card from eShakti! Residents of Canada and the U.S. can enter to win a $50 gift card from eShakti using the rafflecopter below until June 9th. Exciting! But what's even better is that the gift card can be used over and above any other discount code or promotional offer. It can even be used along with the new customer registration gift coupon of $25! If you simply can't wait and you must build your spring/summer wardrobe right now, register and get $25 off your first order at www.eShakti.com. Good luck! *I received product for review purposes. All opinions are authentic. This post contains affiliate links. You look beautiful! Love the dress. I love the Strapless chambray maxi dress! You chose a lovely dress too! I like the leanear pleats maxi skirt. Thanks for the chance to win! I like the Birds Eye View Dress. So many beautiful dresses!! Adorable dress, looks great on you! I like the Banded Stripe Poplin dress. I love the color and print of the Flat floral print notch neck dress! I love the FLoral Print Retro Sundress! So many cute options. I love the "Victoria dress"
I love the Jennifer dress (and not just because that is my name too!). So cute! i love the Polka dot print sweetheart dress. they were all so cute though. That dress is lovely on you. The setting for your pictures was beautiful, and your daughter did a great job! I love the Empire waist floral cotton dress! I like the Peony cotton knit dress. I so loved all the dresses! My favorite is the Empire Waist Floral Cotton Dress! You looked very beautiful! Thank-you for a great giveaway! The bird print crochet lace trim top looks cute, though I am not sure the wife would wear it. Love the Polka dot print poplin dress! I love the Blakely dress with the super-cute belt. I love the Floral embellished cotton cambric dress. wow!! there is so many to choose from. they are all really nice. but... I will say the "Her fifties colorblock knit dress"
I would really love the polka dot sweetheart dress. I love the Graphic embroidery peasant dress! I like the Layered surplice mosaic print dress and the Tribal geo print sash tie dress. I like the Black cotton knit dress. I love this one: http://www.eshakti.com/Product/CL0029826/Scallop-collar-cotton-knit-dress so cute!! I love the Sharon dress in yellow! I love the corset style jersey knit dress, so pretty. I love the Ellen dress in orange! http://www.eshakti.com/Product/CL0030563/Ellen-dress#review I'm saving my pennies so I can get it, lol. This is difficult to pick just one! Though I think I'd get the most use out of the tie-neck cotton poplin dress, any of the colours. I need summer dresses, so now I guess I just have to save up. I like that they have almost-retro styles, too, for much less than the brand names. I love the chevron stripe colorblock maxi dress. I can't decide -- there are so many nice dresses. The Trellis pleat knit dress is one of my favourites. It's a hard choice, but I have to say the The Faith Dress. It's simply beautiful. I like the Hailey dress! Love the Contrast banded trim poplin dress! I love the Havana dress. The Pin-up embellished poplin dress is beautiful!!! The dotted circle skirt in mint! I like the Collared rose print shirtdress. My favorite item is the Embellished graphic geo print maxi dress.. but they have a ton of cute things. I had never heard of this store before reading about it here and am bookmarking their page. 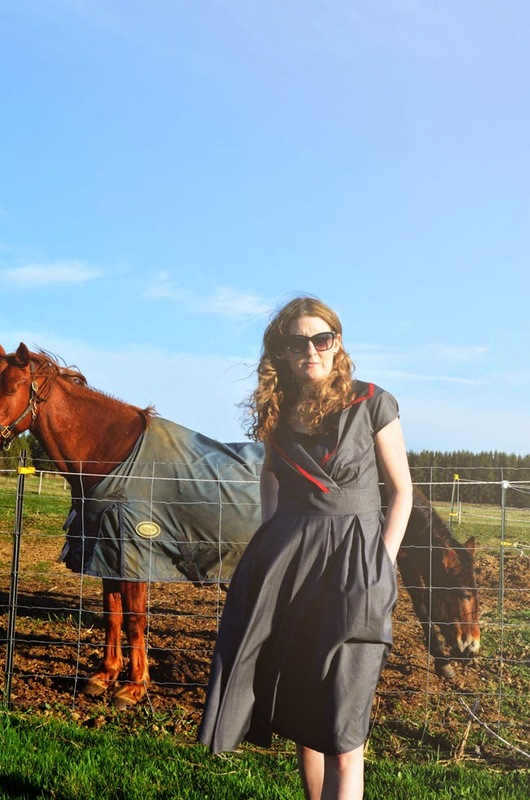 I love the Sash tied chambray voile dress.